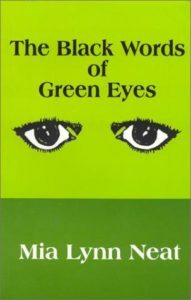 The Black Words of Green Eyes by Mia Lynn Neat is her fulfilled lifelong dream which encompasses experiences and events that have influenced her life. Each poem possesses some form of growth that Neat has gone through and best tells the story of her life and perceptions of it. She emphasizes the fact that her poetry is meant to relate to others and act as an aid in the lives of others hoping to be positively influenced. Mia Lynn Neat attended the University of California at Berkeley where she received her Bachelors of Art in Psychology and Social Welfare. She is well known for her dreamy perception of life and emotional expression through her poetry. With each poem, Mia Lynn Neat is establishing herself as a new and exciting talent in the world’s pool of distinguished poets.